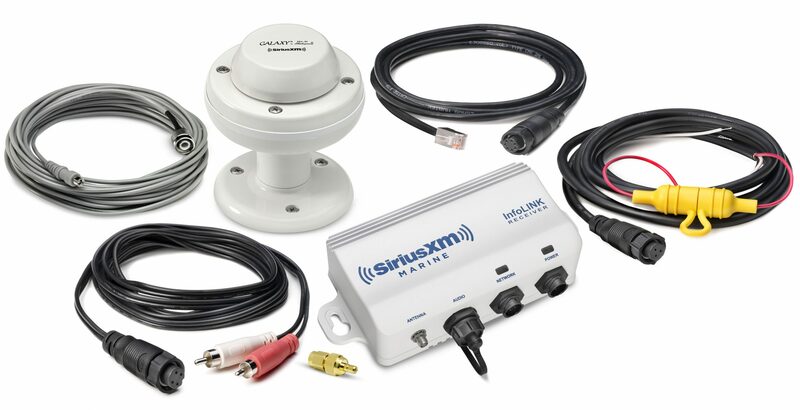 Previously, SiriusXM provided core modules to their marine weather partners — Furuno, Garmin, Navico, and Raymarine — which those partners used to build their own finished satellite receiver products. Now, SiriusXM is working with a hardware manufacturer to build complete next-generation marine receivers, branded as InfoLink, for their partners. 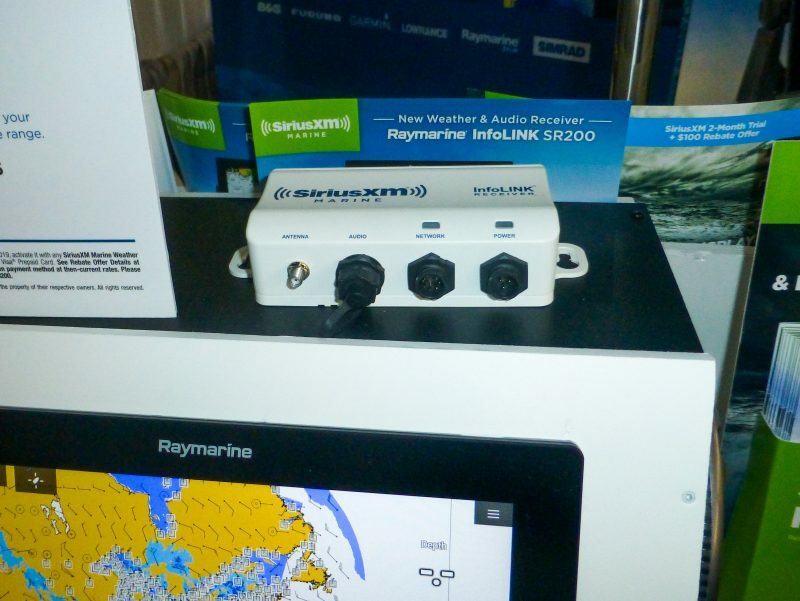 Furuno recently announced their InfoLink, Raymarine is also offering one, and more brands will likely follow. 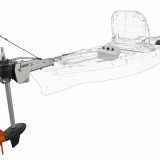 The previous generation Raymarine SR-150 and Furuno BBWX3 both had list prices of about $800 and were usually available at resellers for about $700. 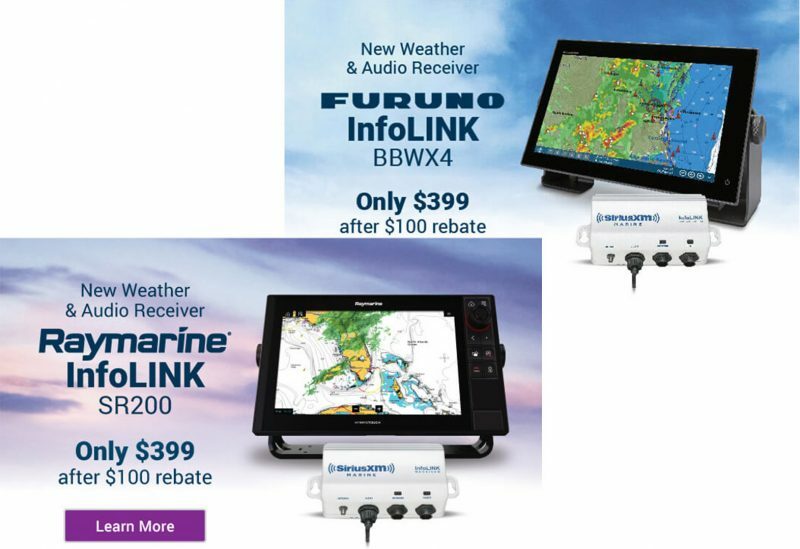 The Furuno BBWX4 and Rayrmarine SR200 both carry $500 list prices and the Furuno BBWX4 is in stock at Hodge’s for $369 before a $100 rebate when you activate service. 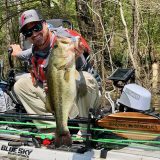 That puts the upfront hardware cost well under $300, making this a pretty affordable boat upgrade. Like previous receivers, the InfoLink is also a SiriusXM audio receiver with line-out to feed your stereo. 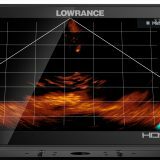 The InfoLink receivers are built on SiriusXM’s latest core hardware and will have greater capabilities than the receivers they replace. Like most satellite-delivered services, bandwidth and receiver capabilities are the biggest factor in limiting the features SiriusXM can deliver. 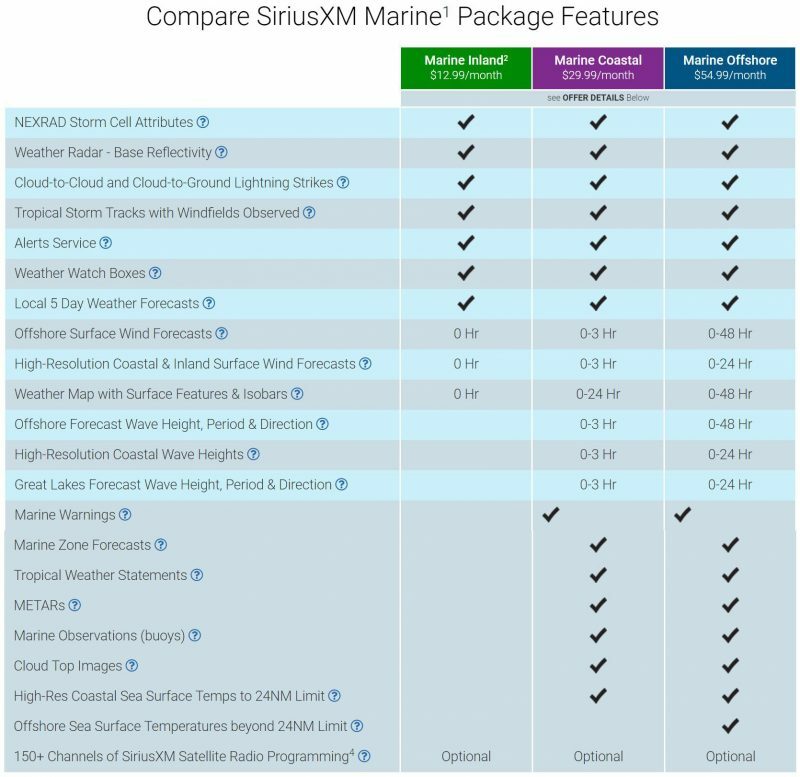 Although there aren’t yet any features in the current SiriusXM Marine Weather packages that requires these new capabilities, we may soon see advanced features, higher resolution or more frequent updates that take advantage of the new capabilities. Using your SiriusXM weather receiver as an audio receiver has always come with a trade-off about how you control the audio and that hasn’t changed. 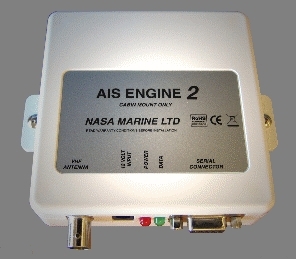 If you use an InfoLink receiver as an audio receiver you will control it from your MFD. That means that you won’t be able to use your stereo head unit, remotes or stereo remote apps to change channels, check song names, etc. I’ve always found the audio control implementations on MFDs more limited than what you get on a stereo head unit. But the InfoLink receiver does support SiriusXM’s advanced audio features like TuneAlert, pause and rewind, and on-demand content, though none of the MFD manufacturers have implemented these new features yet. You still have the option to purchase a separate tuner module for your stereo (like the Fusion Apollo RA-770 that does implement the new features), split the antenna feed and separate your subscription onto two radios, one for weather and one for audio. SiriusXM says the price is the same if you use one receiver for both audio and data or if you split to one for audio and one for data. In addition to purchasing a receiver, you will need to choose a service plan from SiriusXM which ranges from $12.99 to $54.99 per month and audio programming is available as a separate option. 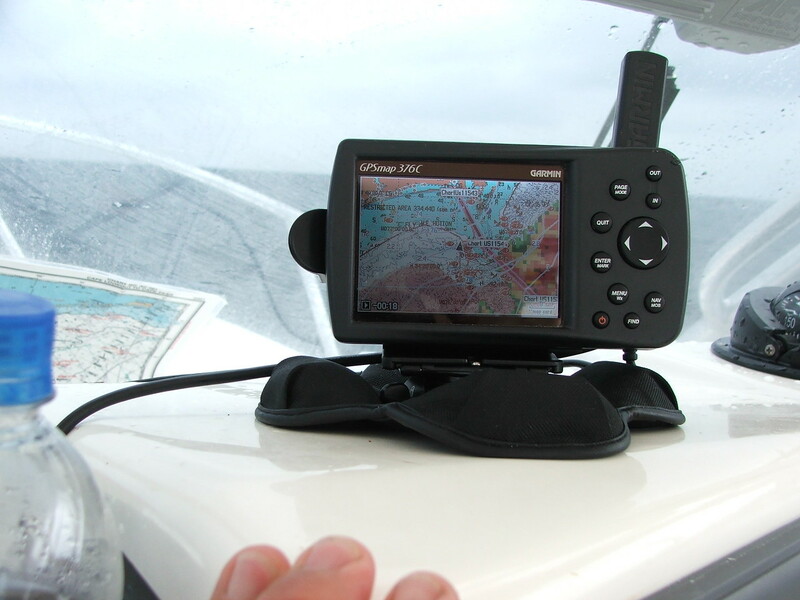 Both Furuno and Raymarine receivers are shown as in stock at several retailers. I would be very interested in this but for what I see as a ridiculously high cost for the monthly subscription. Half of that per month would be acceptable but the Coastal plan at $30/mo is too much IMO. Not sure that how you feel personally about the price is relevant to a conversation about equipment. Millions of customers pay $20 a month in their car for Sirius XM. $10 a month more for weather seems like a bargain. Well, it is relevant to this discussion because the subscription costs will quickly dwarf the capital costs of the now cheaper receiver module. For those of us cruising far from home & off the grid, for perhaps 2 months of the year, the rigidity of the Plans allowing for only 6 months of ‘dormancy’ is another extra expense. Many of us do not spend hours a week in our cars & may have access to lots of online programming without subscribing to Sirius’ satellite entertainment. I stand by my comments in saying that the Sirius XM weather System subscription would be much more compelling at half the price. That is a way better answer than your personal opinion of how much you think it should cost. Knowledge and facts are great in a discussion. What you think personally is just not adding anything of value. people pay $20/month?! most people i know pay on average of $5/month (either $30 for 6 months or $60 for 12 months). I would be interested to know how you gain access to the weather subscriptions at such a great price. Do you have any links you could share? read the posts again. he was talking about the subscription for a vehicle. not marine weather. You either like or you don’t. My wife and I fish offshore from the deck of a 21 foot DC Whaler and have used XM Marine Weather since 2006 (Garmin 376c). It’s saved out backsides on numerous occasions and given us the information needed to stay inshore or not go at all. 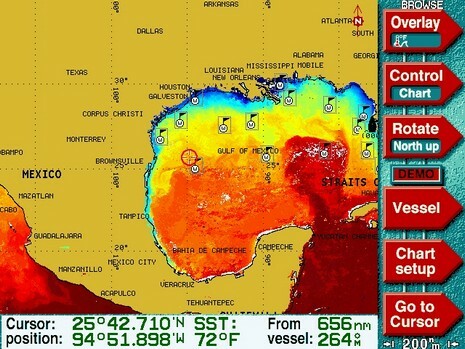 We don’t have radar so when your fishing 50 miles offshore it is invaluable. Yes there is an expense but it is well worth it.